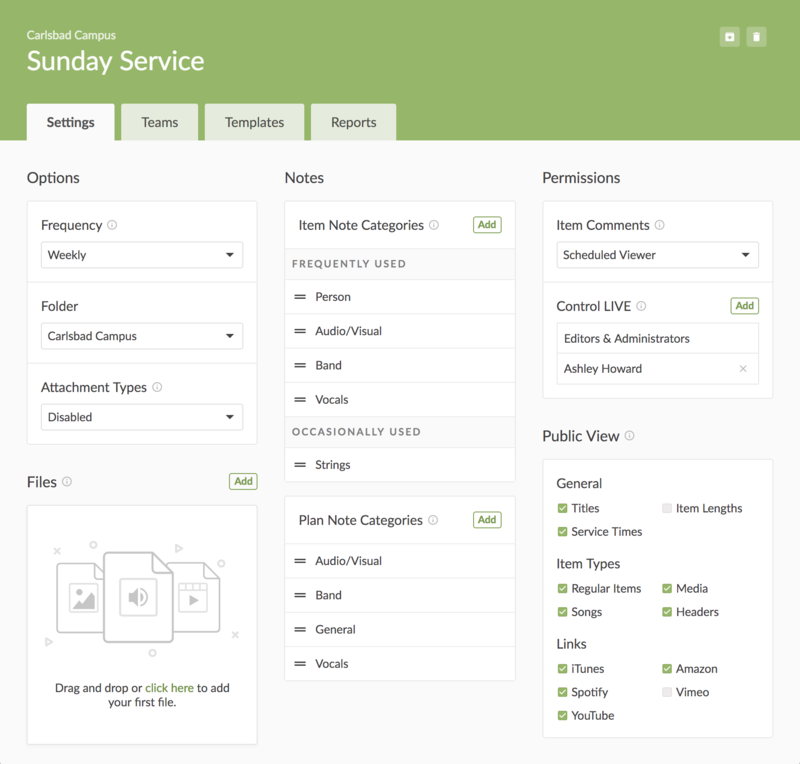 Service Types are one of the key organizational units in Planning Center Services: the container for your plans (usually weekly), teams, and templates. We’ve consolidated multiple popups into a new Service Type page, making each feature easier to find and use. Plus, we’re throwing in some new and updated reports we think you will love. The settings tab contains most of the options in the previous Edit Service Type popup, with the addition of Files and Notes, which were in other places. Other than Files, the settings on this tab can only be changed by Administrators of this Service Type. Though Editors and Schedulers can’t change these settings, they can now see them to better understand the setup. 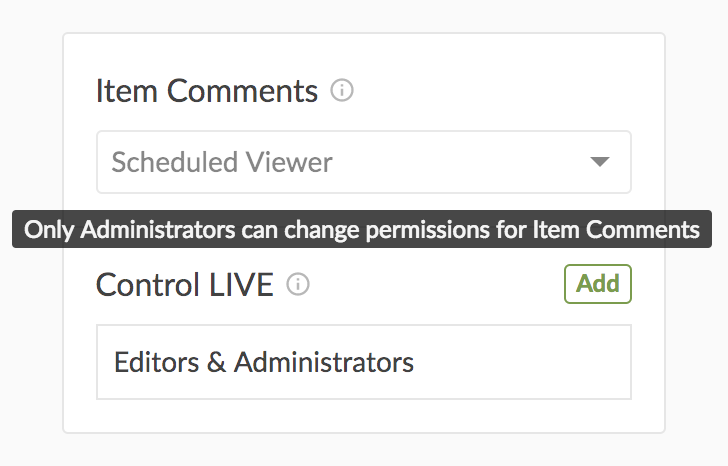 When they hover over a restricted setting, they get a tooltip about the permission requirement. The Files section is accessible by Schedulers, but only editable by Editors and Administrators. Files added here will be available to all users in every plan for this Service Type. Item Note Categories provide places to add extra information to items in your plan. Each category previously had an option to make it “Sticky,” which we’ve renamed Frequently Used. When you are editing an item in a plan, frequently used categories always show, even when they’re empty, to make it easy to add a note, hit the tab key, and add the next note. Categories in the Occasionally Used section on the settings page, are tucked away in the Add Another Note button when you’re editing a plan. 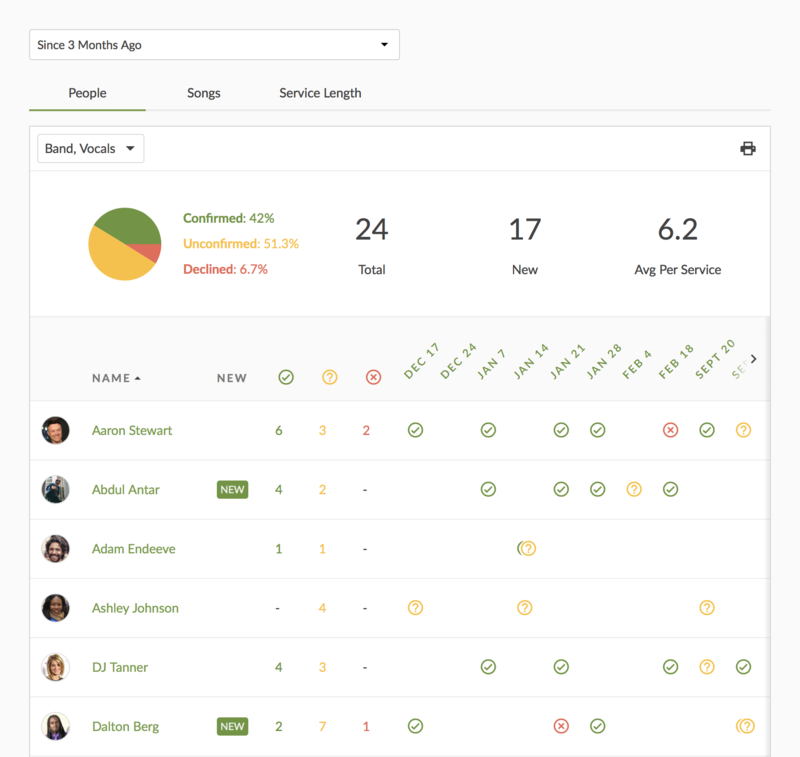 The Teams tab is where Schedulers can manage the teams in a Service Type. We’ve also put two settings related to Teams at the top of the page, though they’re only editable by Administrators. Since this is now on a full page instead of a popup, we’re taking advantage of the extra space to give summary information about each team, like what type of team it is, how many people are assigned, and important dates. There are three other new features here, too. Use the checkboxes to select teams and either email all members, or print a people report. If you’ve archived or recently deleted teams in this Service Type, there will be a button at the bottom where you can restore them. Any team with no members, or that has never been scheduled, will have a red badge to let you know you might want to delete it. The Templates tab gets the same treatment as Teams, adding helpful summary information to let you know if it’s being used for Items, Teams, or Notes. The most exciting new feature on this page is the Reports tab. Two of the reports included were already available in simplified form, but they were hard to find and most people didn’t know they even existed! 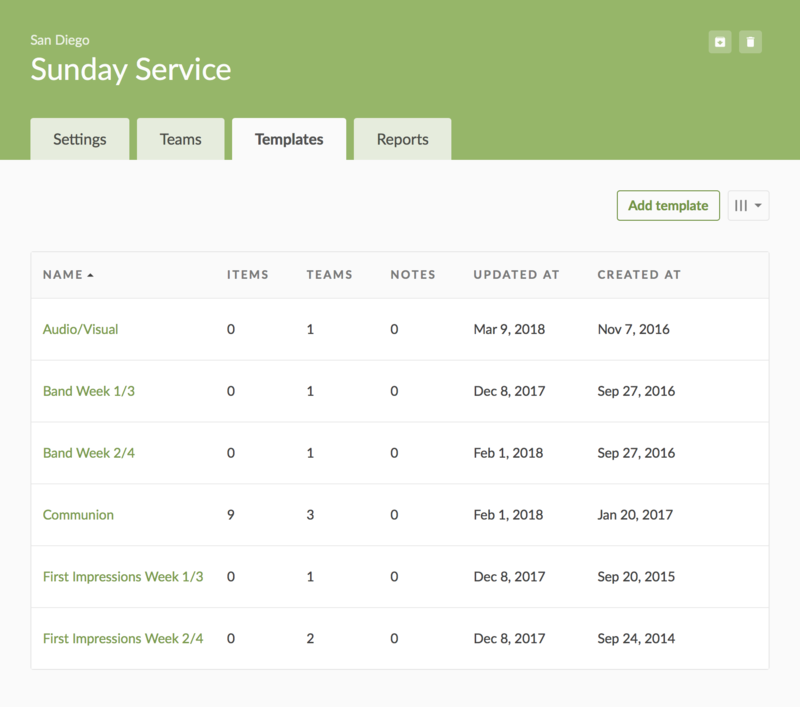 We greatly improved the People and Song reports, and we added a new Service Length report that will be especially helpful for churches who use Services LIVE. The People report shows you all the people scheduled in selected teams over a period of time, and now includes their status. If a person is scheduled to more than one team, you’ll see each status stacked on top of each other, like Adam in the screenshot. If you want to see who is accepting, declining, or not responding the most, click the status icons in the header to sort by those numbers. And if you want to see everyone you’ve scheduled for the first time during the selected date range, click the New column header. By default, any teams you are involved with (My Teams) are selected in the Teams list, but you can manually select any team in the Service Type. You can also print the report using the print icon at the top right. 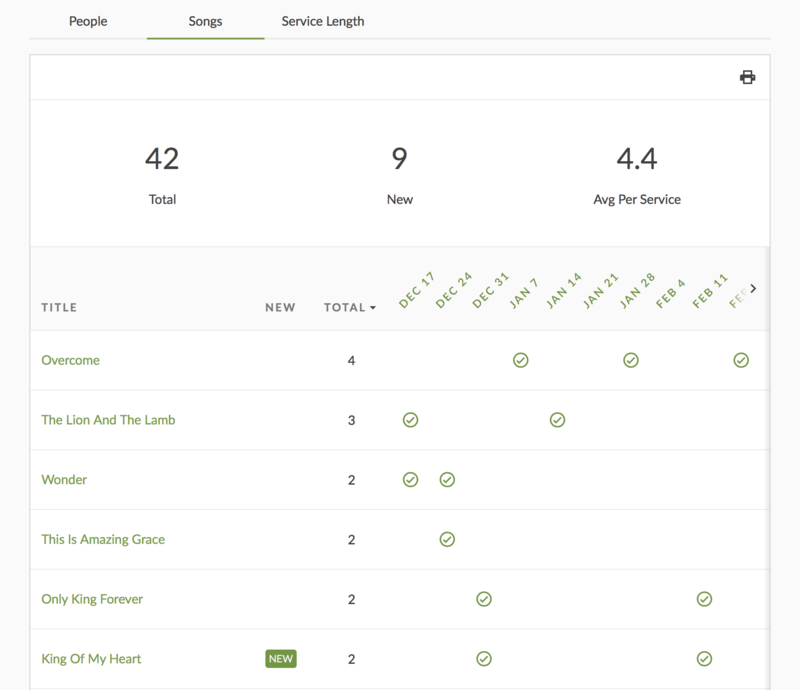 The Songs report shows you all the songs used in your Service Type over a period of time. Like the people report, you can click the New or Total column headers to sort by which songs you’ve used for the first time, or by the amount of times you’ve used them. 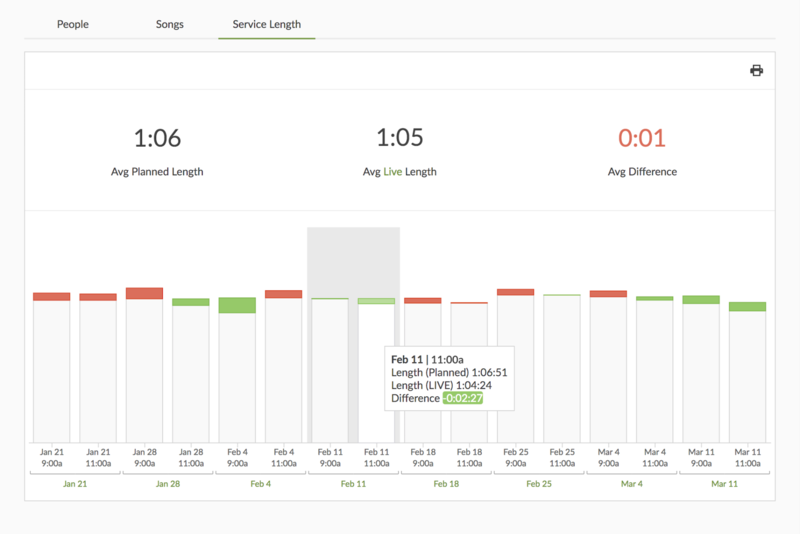 The brand new Service Length report shows you the length of each service time across your date range. If your plans have more than one service time, each time gets its own column, but is grouped with the other times in the same plan. The report shows how long each time was planned, and if you use Services LIVE you’ll also see how long each service actually took. If a time went longer than planned, you’ll see the difference in red, and if it ended early, it will be in green. Over the years we’ve noticed many churches have Service Types they don’t need anymore. 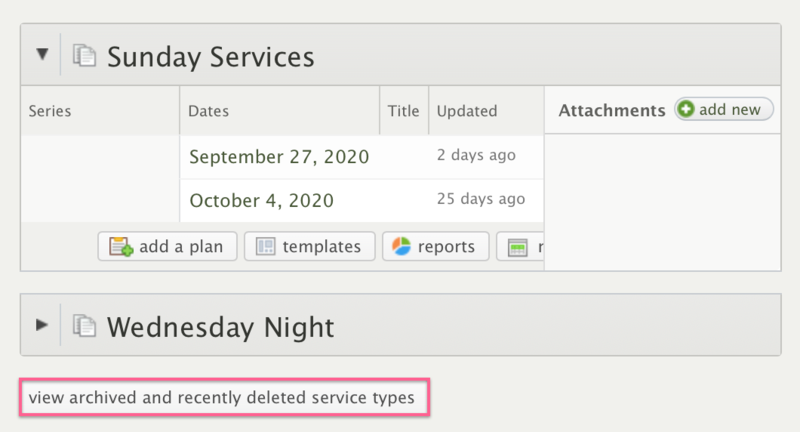 Until now, we’ve recommended creating a new folder called “Archived”, and moving those Service Types there. With this release, you can now officially archive a Service Type by clicking the Archive button at the top right. When you archive a Service Type, all of its teams are also archived and will no longer show on people profiles or on the main Teams page (even when you filter to Archived Teams). You can view archived teams, and teams deleted in the last seven days, from a new button at the bottom of any folder. 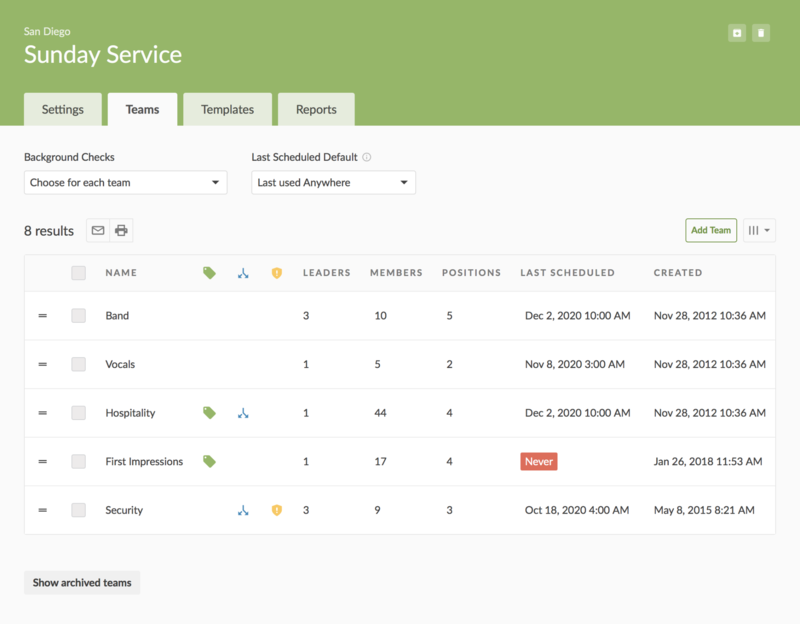 Click that button to view the missing Service Types so you can restore them. 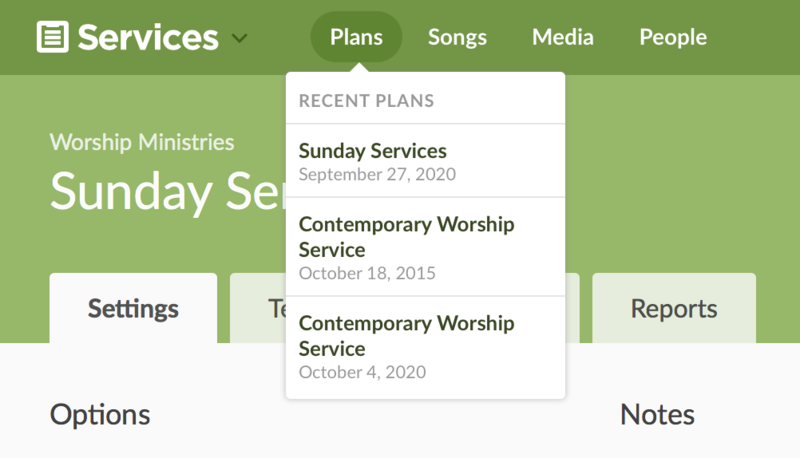 When you’ve finished using the Service Type page and are ready to get back to your plan, you can hover over the Plans tab and get right back to the plan you were just working on. In fact, you can do that from almost anywhere in the app! Start making that a habit and you’ll be zipping around the site like a pro.